My husband and son have been watching The Flash television series. I have been watching it with them here and there. The current story arc involves The Flash and his cohorts traveling to an alternate Earth. One in which their dopplegangers are almost polar opposites of themselves on Earth 1 as they call it. So, with random time to think driving home, I started to wonder what my doppleganger would be like in an alternate universe. I know, I know...totally impossible and probably not healthy. Well, I can tell you that the latter is absolutely true. My doppleganger (in my mind) had some pretty amazing traits...which sounds good, except that she was nothing like me, at least in my mind. Yup, the stinkin’-thinkin’ self deprecation started creeping in. She was skinny. She was successful. She was a great housekeeper…well, I can’t argue with the housekeeping thing. I will say that she was quite an unfunny bore and a pretty cruddy friend (which is totally opposite of who I am, here). But I digress. Then, I felt this ‘tap’ on my conscience. Is that really how God wants us thinking about ourselves? Should we beat ourselves up? What exactly does that accomplish? 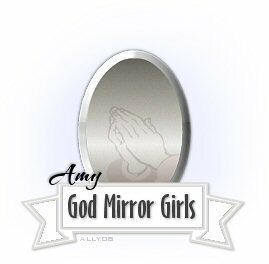 I really need to spend some time at my God Mirror. What started as a ‘what if’ idea, turned into beating myself up. If I’m not reflecting to myself what God sees in me, am I effective in reflecting to others what God sees in them? Back to the God Mirror….Maybe I should listen better, this time. Or go back more often. Or, maybe both. What would your doppleganger be like?